AComodo IceDragon is a friendly web browser with multi-tab support, Facebook integration as well as various security features. You can setup the program through a classic installation process or skip it altogether and use it as a portable app. During setup, users are offered the options to import their passwords, history, cookies and list of favorites from their default browser and to switch to COMODO SecureDNS. 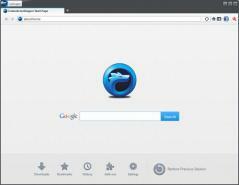 The layout is similar to the one of Mozilla Firefox and since Comodo IceDragon relies on the Firefox engine it supports all of its addons and plugins. Moreover, you can change the browser’s theme and use essential web development tools such as the error console, debugger, web console and so on.